Have you ever closed out of a browser window you didn’t mean to? Don’t panic. There’s several ways to get back to that page. Internet Explorer 11, Firefox, and Chrome all allow you to retrieve the tab easily. Press Ctrl+Shift+T or right-click on the tab bar and select “Reopen closed tab.” Viola! The page is back open. If you press Ctrl+Shift+T again, it will open the second last closed tab. 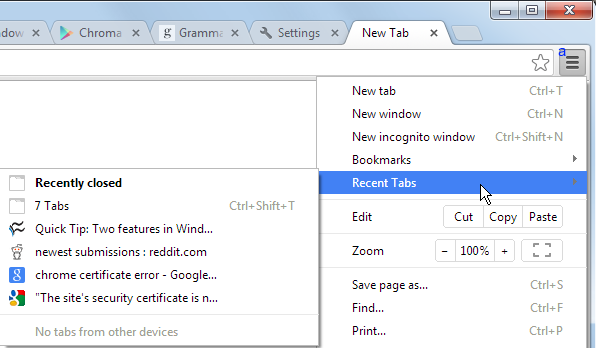 Firefox and Chrome also have methods of retrieving closed tabs via their settings menus. In Chrome, simply click the “hamburger” menu symbol. Near the top, you’ll see the option for “Recent Tabs.” Mouse over that and select the tabs that were recently closed. In Firefox, it’s only slightly different. Click the “hamburger” menu and then select History (the clock icon). This will pull up a menu that allows you to see and restore the closed tabs. That’s all there is to it! Never fear a slip of the mouse again.